Losing weight on the South Beach Diet plan happens a lot easier when you're not starving yourself. Whether you're on south beach diet phase 1, phase 2, or just a maintenance phase, my favorite and most basic approach was to find foods that I like but offer at least a little bit of variety. 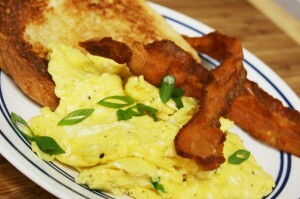 Say hello to eggs and Turkey Bacon. I ate it for breakfast. Sometimes for dinner. And almost every day. And I actually enjoyed it! OK, the limited diet on South Beach during the first 2 weeks takes some work to get used to compared to a low glycemic diet or other plan. I guess I can count myself lucky that I found a safety food that was acceptable during all the phases of South Beach that I actually liked. If you haven't tried the low fat lean mix of turkey bacon, give it a try. Combine it with seasoned eggs and enjoy!